IsiZulu Sami Nawe, the first post-democracy isiZulu reference book will be launched tomorrow, Thursday 18 October 2018, at the Wits School of Education. The last reference book of this nature was published in 1992 and its predecessor in 1980. 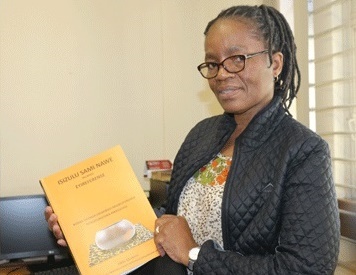 Wits academic and author, Fikile Khuboni is delighted that her dream and labour of five years has come to fruition. “The book was born out a realisation that many learners struggle with understanding the basics of language, particularly grammar. As a result, many think isiZulu is hard. What compounds the problem is that educators in some schools did not train as isiZulu language teachers, but take on the role to fill a vacancy,” says Khuboni. Khuboni, who has co-authored several books, says that she consulted colleagues and young people when compiling the book, as she wanted to present it in a reader- friendly manner. Consequently, the layout and design of the book is appealing and uses big fonts and colours. This book was also informed by Khuboni’s years of training educators at Ntuzuma College of Education, Durban College of Education and later, the University of KwaZulu-Natal. She also served as a Subject Advisor in the Department of Education in KwaZulu-Natal. As an external moderator of isiZulu first language papers for Grade 12 ensure she has a wealth of information on curriculum development, changes, and the challenges of both teachers and learners. A mother to a high school learner, Khuboni says that her love for African languages helps her support her son, but she often wonders how others without this knowledge cope. Khuboni says her book will help even mother tongue speakers to renew their understanding of the language and to deal with the challenges that parents encounter when helping children with homework. “As adults, we forget what we were taught in class during our time, so this is a perfect bridge,” she says. Khuboni’s advice to Grade 12 learners who are writing isiZulu is to do proper revision and use past exams papers, as these are helpful. She is also advising them to get a copy of IsiZulu Sami Nawe as it will greatly assist them to be ready for all the three papers. The book launch is open to all. Order your copy.